Figure 1. The current PorchCam image. The overlay states the date and time the image was taken. The previous PorchCam, version 2.2, died after an update. Because the web-based software used Microsoft ActiveX technology, and no modern web browser uses that technology, I had to give it up. You can read my trials here. About a year ago, I tried another camera, but it didn’t work out either. And the Nest camera is fun, but inaccessible for purposes of capturing a still image to toss up on the Wambooli home page. Never one to give up easily, I kept my eye out for new webcams. Eventually, I saw one on sale for $90. I figure that for $90, I could give it a try. If it didn’t work, I could hack it and use it as a robot’s camera, so I wouldn’t lose any money. To my surprise, the camera didn’t use ActiveX technology. It still requires a plugin to see the image on the web, but that wasn’t why I purchased the camera. I studied the camera’s Application Programming Interface (API) and experimented with a few of the functions. 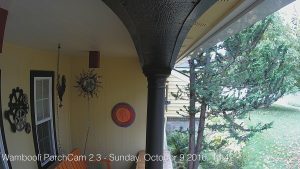 After a few hours, I was able to access the camera’s images and get it to capture a still shot just like the old PorchCam, version 2.2. 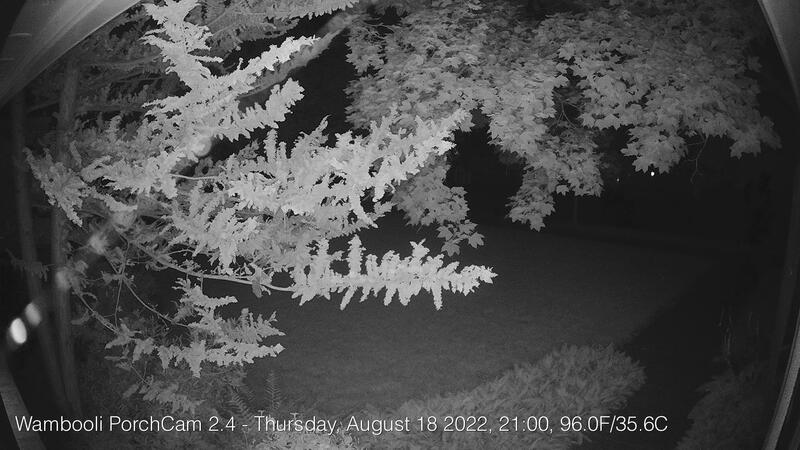 In Figure 2, you see the first still image I captured after setting up the camera outside. Figure 2. The first official image from PorchCam 2.3. The first is to get the zoom function enabled. Unlike previous PorchCams, this one can zoom in or out. I haven’t yet added that functionality, but I will in the future. Second, I’m going to add a homing function that will automatically reset the camera to actually look at the front walkway. That function will avoid confusion when someone has moved the camera to point, say, at the soffit above its mount. Third, I’d like to add the current weather to the page, so you can see the temperature and current condition. The government changed the format of its weather webpage and I have to learn a new technology to read the raw data. Either that, or surrender to another weather data feed. This item is a low priority. Looming big on the PorchCam’s horizon, however, is the season: Winter is coming. The cold and snow may bode well for the Starks, but my webcam is an internal model, not designed for outdoors. In previous years, cameras have died over the winter. Come spring, I might find myself writing another post for PorchCam 2.4. Until then, enjoy!